Some bands fail to stand out, while others immediately seem to have something special. 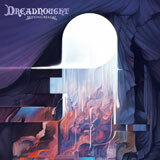 As you can probably tell if you are familiar with them, Dreadnought, from Colorado, never really stick with one genre and their songs are a chaotic rollercoaster ride. However, does this unpredictable musical journey produce good results? The answer is yes… and no, too. Confused? Keep reading this. The first song, Ode To Ether initially creates a mystical, oriental-sounding atmosphere, but rapidly evolves into something completely different – a sort of progressive death metal song with some psychedelic elements and soft prog rock passages. The second track, Odyssey, features a jazz-influenced piano riff and is extremely melodic until the heavy, distorted guitars and the screamed vocals kick in; however, the feeling of the song keeps changing dramatically – one minute we are introduced to beautiful and relaxing melodies and then we find ourselves adrift in a sea of sonic brutality, and this continues until the end. The jazz vibe and their progressive death metal influences, reminiscent of old Opeth, are felt throughout the entire record; however, the complex and eclectic nature of their art is what really defines them as composers. Bridging Realms contains extremely rich and diverse sounds and the music is also astonishingly visual, allowing the listener to create wonderful images that make the listening experience much more exciting and enlightening. This is also the kind of record that grows on you the more you explore it. If you have this as background music, you probably won’t be able to notice and appreciate all the little details, so do yourself a favour – ignore everything around you and pay attention to this album. Still, not everything is perfect as there is also the feeling that, sometimes, too much is happening at the same time. Yes, this is a great album – we have established that – but occasionally we also wonder if they wouldn’t get equally good results if they made a few things less complicated. In a way, we could explain this using the following analogy: imagine a film director who is really talented but made a few mistakes along the way, yet still managed to craft a compelling story with intelligent characters. Dreadnought are like that at the moment – a diamond in the rough. This is a nice record to listen to anyway, and they are close to creating an astounding masterpiece in the future – they have the skills to do so. We shall patiently wait.